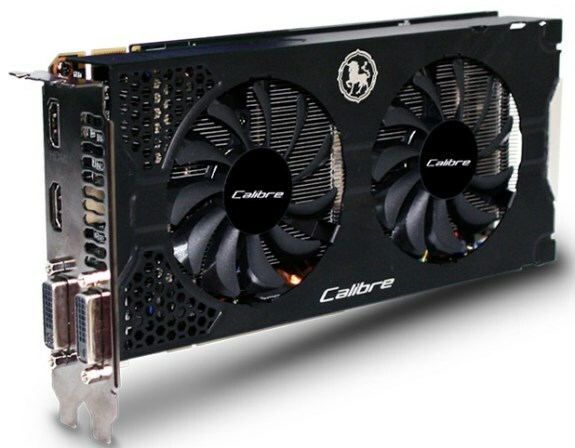 Sparkle starts shipping the Calibre X660 Dual Fan, a new GeForce GTX 660 with 1059MHz core, 1124MHz boost and 2GB GDDR5 memory clocked at 6008MHz. It's a dual-slot card with dual-DVI and dual-HDMI outputs. Calibre Series brings introduces an exciting new product to life today: the Calibre X660 Dual Fan Solution. The latest X660 Dual Fan Solution clocks at 1059 MHz core frequency with boost up to 1124 MHz and 6008 MHz memory speed, delivering class-leading performance achieving an 8% performance increase at default overclocked setting. The Calibre X660 Dual Fan is equipped with the ultimate dual silent PWM cooling fan, by utilizing 3 units 6ø ultra cool heat pipes, the heat is easily dissipated from the surface of the cooling fin, fully covering the key components onboard. The dual Fan provides up to a 15°C lower temperature than the reference board. The latest graphics solution utilizes the best components a graphic card can have, such as a tantalum cap, alloy choke and uses the SO8 Powerpack, allowing a stable gaming performance event at overclocked setting. The Calibre X660 Dual Fan retains the NVIDIA Kepler-powered family features, with the best in class gaming performance and power efficiency, with an advanced cooling design, offering the best gaming weapon at an affordable price for all gamers.